"After the Aldous Huxley Centenary Symposium, which I organized at the University of Münster in 1994, many participants encouraged me to found an international society devoted to the study and promotion of the thought and writings of Aldous Huxley. However, I was convinced from the start that such a venture would require a solid basis in the form of an institute or research centre which could function as a vehicle for the activities of the society. Once the Department of English, the Faculty of Philology (Fachbereich 9) and the Rektor of the University of Münster had pledged their support for the Centre for Aldous Huxley Studies, which I gratefully acknowledge here, the foundation of the Aldous Huxley Society could be scheduled for 25 June 1998. Prof. Dr. Lothar Fietz (University of Tübingen), a leading German Huxley expert, kindly agreed to give the inaugural lecture on a characteristically Huxleyan subject: "Mythos, Geschichte und Utopie: Ideologie und Ideologienkritik im Werk Aldous Huxleys" (Myth, History and Utopia: Ideology and Critique of Ideologies in the Works of Aldous Huxley). In a compelling systematic survey of ideological interpretations of myth, history and utopia he discussed changes and recurrences in Huxley's critical assumptions as reflected in his novels and essays from the twenties to the sixties, thus opening up new avenues of research for Huxley criticism. The lecture and the subsequent founders' meeting were attended by about sixty participants, among them the doyen of the Department of English, Prof. Dr. Edgar Mertner, and the Dean of the Faculty of Philology, Prof. Dr. Volker Honemann, as well as Prof. Peter Firchow (University of Minnesota), Dr. James Hull (Zürich) and Prof. Dr. Gerd Rohmann (University of Kassel) as distinguished foreign and non-resident guests. At the beginning of the founders' meeting various addresses from abroad were read out; Mrs. Laura Huxley, widow of Aldous Huxley and Honorary President of the Aldous Huxley Society, had even sent a recorded message, which was played to the audience. The meeting then passed the by-laws and elected the Executive Committee as well as the Board of Curators. Finally, the inauguration of the Aldous Huxley Society was rounded off with a reception sponsored by the British Council, Köln, the Buchhandlung Poertgen-Herder, Münster, and the LIT Verlag, Münster. On the whole, the foundation of the Aldous Huxley Society was a promising event, which was widely publicized on the radio and in German and foreign newspapers." 9:15 - 10:45 a.m.: lecture on "BRAVE NEW WORLDS: Aldous Huxley and the Challenges of Globalisation"
8:00 - 10:00 p.m.: Kirpal Singh reading from his own works (Singaporean and other Southeast Asian literature in English). 4:15 - 6:00 p.m.: Prof Jerome Meckier, workshop on "Aldous Huxley and the Utopian Tradition: Brave New World and Island"
9:15 - 10.45 a.m.: Prof Jerome Meckier, lecture on "The Brave New World Typescript"
11.15 - 12.45 a.m.: Prof Bernfried Nugel, lecture on "How Reliable are the Current Huxley Texts? - Toward a Critical Edition of the Works of Aldous Huxley"
2:15 - 3:45 p.m.: Dr Willi Real, didactic workshop on "Brave New World and Island: A New Course Plan"
9:15 - 10:45 a.m.: Prof Sanford Marovitz, lecture on "Aldous Huxley's View of Nationalism"
4:15 - 5:00 p.m.: Prof Jerome Meckier, lecture on "Aldous Huxley's American Experience"
The Aldous Huxley Society and Professor Kirpal Singh (The Centre for Cross-Cultutral Studies, Singapore Management University) are happy to announce the Aldous Huxley Symposium in Singapore, 28 December 2000 - 01 January 2001: "Brave New Worlds: Aldous Huxley and the Challenges of the Third Millennium"; see Singapore. Third International Aldous Huxley Symposium: "Aldous Huxley, Man of Letters: Thinker, Critic and Artist"
For the detailed programme (pdf) see Riga. Prof Kirpal Singh (Singapore Management University): "Poetry and Politics: Going Beyond Niceties and the Problems of Post-Colonial Honesty"
Volume 7 of the Society's series "Human Potentialities" has been dedicated to Bernfried Nugel on this occasion: Hermann J. Real, Peter E. Firchow (eds. ): The Perennial Satirist. Essays in Honour of Bernfried Nugel, Münster, 2005. In 2012, Ries Baeten, member of the Aldous Huxley Society (AHS), suggested that Huxley’s grave in Compton Cemetery should be renovated and had the idea, among other things, of placing an oak bench near the grave for visitors to relax and meditate on Huxley. The International Aldous Huxley Society and the Aldous & Laura Huxley Literary Trust agreed to support this project and shared the costs. The bench was dedicated, in the presence of Ries Baeten and former secretary of state and long-time local Member of Parliament, Mrs Virginia Bottomley, on 26 July 2013, in time for Huxley’s birthday. As a call for awareness, taken from Huxley’s novel Island, “Here and now, boys!” (suggested by AHS member Uwe Rasch) has been carved on the top rail. The bench is placed in the cloister in close proximity to Huxley’s grave in front of the G. F. Watts Memorial Chapel. For a selection of pictures, see below. From 11th Oct to 8th Dec 2013, the Dairy Art Center in London's Bloomsbury area is showing ISLAND, an exhibition based on Huxley's novel, bringing together over forty established and emerging international contemporary artists, such as Ai Weiwei, Cindy Sherman, Per Kirkeby, the Chapman brothers, Sigmar Polke and Julian Schnabel. For more information, see Island. - Article in Financial Times, see Financial Times. - A video review of the show, featuring curator Sarina Basta, and Dairy Art Centre founder Nicolai Frahm, see Video Review I or Video Review II. - Video Review with text and images from the show, see Video Review III. This is a day of sad remembrance for all Huxleyans but it is also an occasion for qualified hope, inasmuch as Huxley’s writings still have important things to say to the twenty-first century and to mankind in general. This is the century in which many of the problems Huxley helped to identify and define will come to a head. The solutions he suggested remain pertinent, worthy of additional consideration. How to preserve the environment? How to stem overpopulation? How to improve education, prevent war, defuse nationalism, protect language, shape a future in which art, drugs, religion and their ilk combine to actualize human potentialities? Within this mental framework Huxley worked also as a distinguished literary critic, art critic, and critic of society and culture. Several essay collections, such as On the Margin (1923), Proper Studies (1927), Music at Night (1931), The Olive Tree (1936), Themes and Variations (1950), Adonis and the Alphabet (1956) and Brave New World Revisited (1958) can be still read with profit and delight nowadays, especially because Huxley was doubtless one of the leading essayists of the twentieth century. His literary oeuvre is characterized by extraordinary variety: apart from essays, he wrote not only poems, short stories and dramas, but also novels and utopias. His first utopia, Brave New World (1932), was dystopia and anti-utopia in one, and Ape and Essence (1948) as well as his musical comedy version of Brave New World (1956) reveal that his anti-utopian thinking deepened over the years; even his so-called positive utopia Island (1962) provides no blueprint of a perfect society but a qualified picture of what might be humanly possible at the time of its composition. Feature celebrating Aldous Huxley's 120th birthday (partly based on live excerpts from an interview with Prof Dr Bernfried Nugel). For the full broadcast, see "Zeitzeichen". “Before Brave New World and After: Aldous Huxley 1894-1963” is the title of an exhibition at the Department of English, University of Münster. It presents a cross-section of the many-sided artistic oeuvre of Aldous Huxley, who not only wrote Brave New World (1932) and numerous other influential novels but also worked as poet, essayist, dramatist, screen writer, art critic and critic of society and culture. 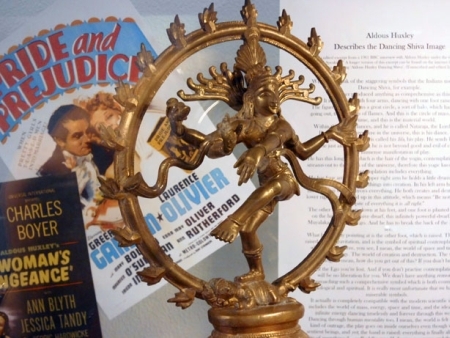 In the second part of his life he increasingly turned to Far East mysticism and came to regard the image of the “Dancing Shiva” (represented here by a brass statue) as a powerful symbolic expression of his later philosophy oriented towards mind expansion. Beside many first editions of his most important books the exhibition also displays bibliophilic specimens, reproductions of several paintings by Huxley, two splendidly illustrated copies of his only children’s book as well as publications and activities of the Centre for Aldous Huxley Studies. This exhibition was compiled and arranged for the CAHS by Uwe Rasch, M.A., in collaboration with CAHS Director Prof. Dr. Bernfried Nugel.